20 by 20 square. 3v3 on the inside with 2 outside players for each time. Key is toplay out get out. Every player is 2 touch. In order to get a point teams must go from one side to the other. Progresson is to connect with additional supporting player. Next progression is that outside players must connect with a 1 touch pass. Tournament. Passing Square - 12 by 12 yards. 4-6 on square. If 6 2 balls are possible. 9v9/10v10 tournament. 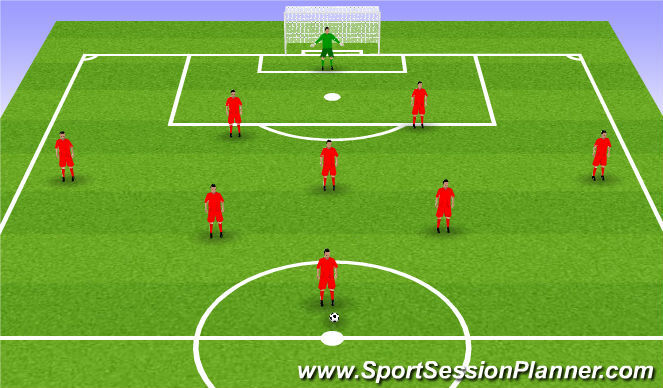 Players must utilize a diamond in the midfield. Missing a #9 and #10 if short of players. 2 touch tournament style play. Focus on the topic taught throughout the practice.